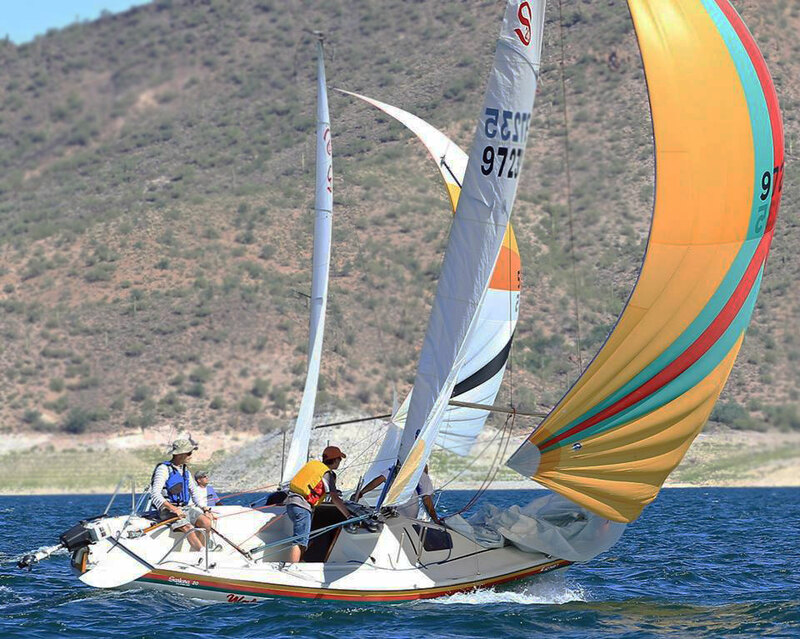 The champs of all the AYC fleets will step onto Catalina 22s this Saturday (5/10) and compete for the club’s most valued trophy: the Club Championship Cup. You’re invited to float your boat to watch, cheer, jeer, and enjoy a day on the water. Once again the favorite has to be Martin Lorch, current holder of the Cup, Santana 20 fleet champ, and four-time winner of this event. Actually, there are two Lorches qualified for the race, with Martin’s son Cedric also qualifying by winning the C14 fleet at Tempe Town Lake. The competitors will gather at Spinnaker Point at 8 am for a Skippers’ Meeting, then will help rig boats graciously loaned by members of the C22 fleet before heading out for a 10:30 am first gun. The regatta will be up to eight short races, with the skippers and their crews switching boats between races to equalize any differences in the performance of the boats. 2014 Club Championship entrants and their fleets are: 2013 Club Champion & Santana 20, Martin Lorch; Catalina 22, Steve Grothe; PHRF Non Spin, Victor Felice; PHRF Spin, Norman Anderson; PHRF Sportboat, Chris Smith; Thistle, Jason Rziha; Buccaneer 18, Emory Heisler; Laser, George Sheller; Capri 14.2, Cedric Lorch. Unfortunately, George Sheller and Norm Anderson aren’t able to make it and will miss the regatta. Fleet Captain Greg Woodcock has planned and will oversee the event as Principle Race Officer. Others on the officiating team are Bob Whyte, Becky Houston, Mike and Maryellen Ferring, Cindy Pillote, and Gail Kiel. Dr. Bob Beers first conceived of the Club Championship in 1967 and set up the Deed of Gift that defines the event and prescribes who may participate. After decades running the event without formal documents, they were instituted about eight years ago and you’ll find this year’s race documents on the racing page.